Chordify helps musicians of all levels to learn and play the music they love. Did you know that one in ten people on the planet plays a musical instrument? That’s over 700 million people! And there is an even bigger crowd that would love to play a musical instrument. Unfortunately, 90% of people trying to learn an instrument quit in their first year. Music lessons are expensive, exercises become boring and practising is repetitive. That’s why we’ve created Chordify. Chordify is a music e-learning platform that transforms any song into chords. With our state-of-the-art music technology, we reshape music education by creating affordable, engaging, and personalized products: Chordify makes it as easy as possible to learn your favorite music. Our service has gained impressive organic traction. This traction illustrates the natural demand for our product, and for music making in general. After Bas finished his PhD in computer science at Utrecht University in 2011, he brought together this team of music enthusiasts to create Chordify. Bas’ research focuses on music information retrieval, digital signal processing, and machine learning. 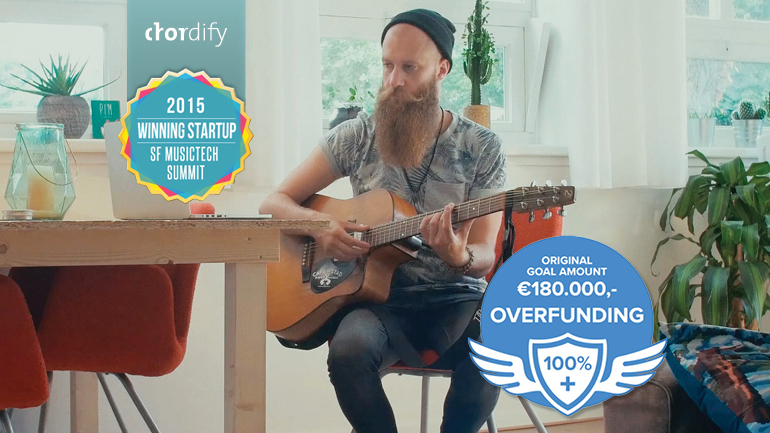 Bas is passionate about music, playing guitar, new technologies, and entrepreneurship. Dion is responsible for Chordify’s design and business development. Dion is an experienced communication designer with over a decade of business experience and a passion for discovering emerging music and musicians. Tijmen is responsible for the front-end of Chordify and works closely with both the back-end developers and designers. Tijmen is a Web, User Experience and SEO-expert. He also plays drums in the bands DJHAGY and Niek Pronk. Previously, Tijmen worked at Distimo App Analytics (acquired by App Annie), AppLink, and AppIQ. Gijs is responsible for Chordify’s design and market development. Gijs is a serial entrepreneur who ran two bureaus for design and visual communication over the last decade. He spent ten years of his life playing in a band with Bas and can’t stop listening to the latest albums of Bon Iver, Suuns, and Benjamin Clementine. Chordify generates healthy revenue to support management, operations, sales, and investments in chord recognition research and product development. We seek an investment to accelerate our product and market development. These fund will be allocated to three important improvements. Mobile – Our website is optimized for mobile use and we have recently launched our iOS app. However, we want to create an additional revenue stream by adding our premium plans to the iOS app and port the app to the Android platform. Social – We make the Chordify platform more social by allowing our users to track, collect and share their practising history and music preferences. Think of it as last.fm for music practising. Embedded player – Influencers from the music industry will be used to promote the Chordify Embedded Player. The Chordify Embedded Player allows artists, festivals and teachers to have the Chordify experience embedded on their own website.